Expressionist architecture is an architectural movement in Europe during the first decades of the 20th century in parallel with the expressionist visual and performing arts that especially developed and dominated in Germany. Brick Expressionism is a special variant of this movement in western and northern Germany and in The Netherlands (Amsterdam School). Expressionist architecture is one of the three dominant styles of Modern architecture (International Style, Expressionist- and Constructivist architecture). The term "Expressionist architecture" initially described the activity of the German, Dutch, Austrian, Czech and Danish avant garde from 1910 until 1930. Subsequent redefinitions extended the term backwards to 1905 and also widened it to encompass the rest of Europe. 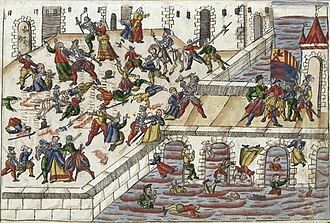 Today the meaning has broadened even further to refer to architecture of any date or location that exhibits some of the qualities of the original movement such as; distortion, fragmentation or the communication of violent or overstressed emotion. The style was characterised by an early-modernist adoption of novel materials, formal innovation, and very unusual massing, sometimes inspired by natural biomorphic forms, sometimes by the new technical possibilities offered by the mass production of brick, steel and especially glass. Many expressionist architects fought in World War I and their experiences, combined with the political turmoil and social upheaval that followed the German Revolution of 1919, resulted in a utopian outlook and a romantic socialist agenda. Economic conditions severely limited the number of built commissions between 1914 and the mid-1920s, resulting in many of the most important expressionist works remaining as projects on paper, such as Bruno Taut's Alpine Architecture and Hermann Finsterlin's Formspiels. Ephemeral exhibition buildings were numerous and highly significant during this period. Scenography for theatre and films provided another outlet for the expressionist imagination, and provided supplemental incomes for designers attempting to challenge conventions in a harsh economicate. Important events in expressionist architecture include; the Werkbund Exhibition (1914) in Cologne, the completion and theatrical running of the Grosses Schauspielhaus, Berlin in 1919, the Glass Chain letters, and the activities of the Amsterdam School. 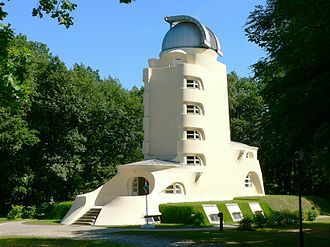 The major permanent extant landmark of Expressionism is Erich Mendelsohn's Einstein Tower in Potsdam. By 1925 most of the leading architects of Expressionism such as; Bruno Taut, Erich Mendelsohn, Walter Gropius, Mies van der Rohe and Hans Poelzig, along with other Expressionists in the visual arts, had turned toward the Neue Sachlichkeit (New Objectivity) movement, a more practical and matter-of-fact approach which rejected the emotional agitation of expressionism. A few, notably Hans Scharoun, continued to work in an expressionist idiom. In 1933, after the Nazi seizure of power in Germany, expressionist art was outlawed as degenerate. 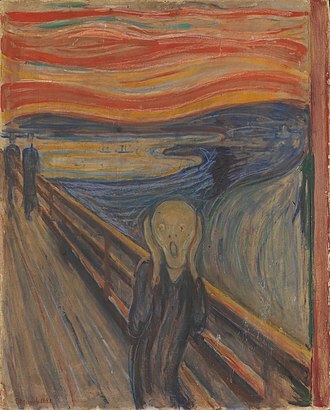 Until the 1970s scholars commonly played down the influence of the expressionists on the later International style, but this has been re-evaluated in recent years. Expressionist architecture was individualistic and in many ways eschewed aesthetic dogma, but it is still useful to develop some criteria which defines it. Though containing a great variety and differentiation, many points can be found as recurring in works of Expressionist architecture, and are evident in some degree in each of its works. Distortion of form for an emotional effect. Subordination of realism to symbolic or stylistic expression of inner experience. An underlying effort at achieving the new, original, and visionary. Profusion of works on paper, and models, with discovery and representations of concepts more important than pragmatic finished products. Often hybrid solutions, irreducible to a single concept. Themes of natural romantic phenomena, such as caves, mountains, lightning, crystal and rock formations. As such it is more mineral and elemental than florid and organic which characterized its close contemporary art nouveau. 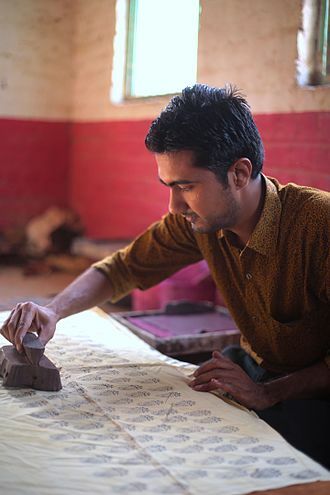 Uses creative potential of artisan craftsmanship. Tendency more towards the gothic than the classical. Expressionist architecture also tends more towards the romanesque and the rococo than the classical. Though a movement in Europe, expressionism is as eastern as western. 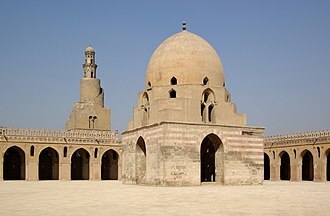 It draws as much from Moorish, Islamic, Egyptian, and Indian art and architecture as from Roman or Greek. Conception of architecture as a work of art. Centennial Hall in Wrocław, Poland, 1911–13 (Max Berg). - Early landmark of Expressionist architecture and UNESCO World Heritage Site. 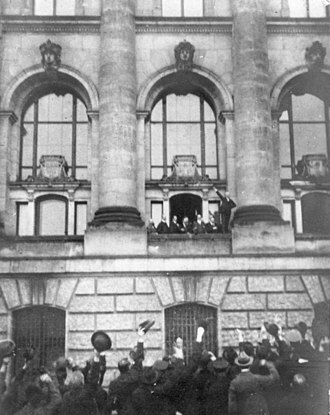 Political, economic and artistic shifts provided a context for the early manifestations of expressionist architecture; particularly in Germany, where the utopian qualities of expressionism found strong resonances with a leftist artistic community keen to provide answers to a society in turmoil during and after the events of World War I. 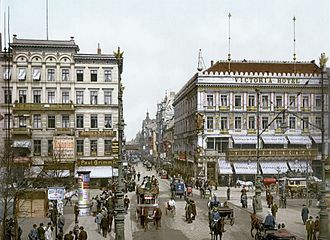 The loss of the war, the subsequent removal of Kaiser Wilhelm II, the depravations and the rise of social democracy and the optimism of the Weimar republic created a reluctance amongst architects to pursue projects initiated before the war and provided the impetus to seek new solutions. 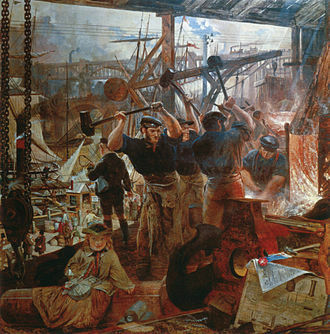 An influential body of the artistic community, including architects, sought a similar revolution as had occurred in Russia. The costly and grandiose remodelling of the Grosses Schauspielhaus, was more reminiscent of the imperial past, than wartime budgeting and post-war depression. Artistic movements that preceded expressionist architecture and continued with some overlap were the arts and crafts movement and art nouveau or in Germany, jugendstil. Unity of designers with artisans, was a major preoccupation of the Arts and Crafts movement which extended into expressionist architecture. The frequent topic of naturalism in art nouveau, which was also prevalent in romanticism, continued as well, but took a turn for the more earthen than floral. The naturalist, Ernst Haeckel was known by Finsterlin and shared his source of inspiration in natural forms. The Futurist and constructivist architectural movements, and the dada anti-art movement were occurring concurrently to expressionism and often contained similar features. Bruno Taut's magazine, Frülicht included constructivist projects, including Vladimir Tatlins Monument to the Third International. 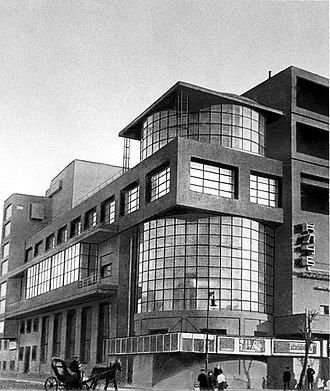 However, futurism and constructivism emphasized mechination, and urbanism tendencies which were not to take hold in Germany until the Neue Sachlichkeit. Mendelsohn is an exception whose work bordered on futurism and constructivism. A quality of dynamic energy and exuberance exists in both the sketches of Erich Mendelsohn and futurist Antonio Sant'Elia. The Merzbau by Dada artist Kurt Schwitters, with its angular, abstract form, held many expressionist characteristics. Influence of individualists such as Frank Lloyd Wright and Antoni Gaudí also provided the surrounding context for expressionist architecture. Portfolios of Wright were included in the lectures of Erich Mendelsohn and were well known to those in his circle. Gaudí was also both influenced and influencing what was happening in Berlin. In Barcelona, there was no abrupt break between the architecture of art nouveau and that of the early 20th century, where Jugendstil was opposed after 1900, and his work contains more of art nouveau than that of say Bruno Taut. The circle of der Ring, did know about Gaudí, as he was published in Germany, and Finsterlin was in correspondence. Charles Rennie Mackintosh should also be mentioned in the larger context surrounding expressionist architecture. Hard to classify as strictly arts and crafts or art nouveau, buildings such as the Hill House and his Ingram chairs have an expressionist tinge. His work was known on the continent, as it was exhibited at the Vienna Secession exhibition in 1900. Many writers contributed to the ideology of expressionist architecture. Sources of philosophy important to expressionist architects were works by Friedrich Nietzsche, Søren Kierkegaard, and Henri Bergson. Bruno Taut's sketches were frequently noted with quotations from Nietzsche, particularly Thus Spoke Zarathustra, whose protagonist embodied freedoms dear to the expressionists; freedom to reject the bourgeois world, freedom from history, and strength of spirit in individualist isolation. Zarathustra's mountain retreat was an inspiration to Taut's Alpine Architecture. Henri Van de Velde drew a title page illustration for Nietzsche's Ecce Homo. The author Franz Kafka in his The Metamorphosis, with its shape shifting matched the material instability of expressionist architecture Naturalists such as Charles Darwin, and Ernst Haeckel contributed an ideology for the biomorphic form of architects such as Herman Finsterlin. Poet Paul Scheerbart worked directly with Bruno Taut and his circle, and contributed ideas based on his poetry of glass architecture. Emergent psychology from Sigmund Freud and Carl Jung was important to expressionism. The exploration of psychological effects of form and space was undertaken by architects in their buildings, projects and films. Bruno Taut noted the psychological possibilities of scenographic design that, "Objects serve psychologically to mirror the actors' emotions and gestures." The exploration of dreams and the unconscious, provided material for the formal investigations of Hermann Finsterlin. Throughout the 18th and 19th centuries philosophies of aesthetics had been developing, particularly through the work of Kant and Schopenhauer and notions of the sublime. The experience of the sublime was supposed to involve a self-forgetfulness where personal fear is replaced by a sense of well-being and security when confronted with an object exhibiting superior might. 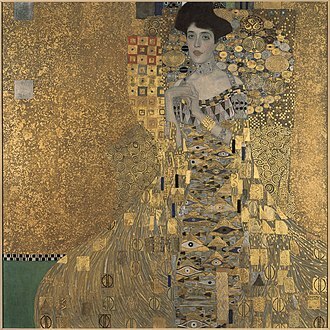 At the end of the nineteenth century the German Kunstwissenschaft, or the "science of art", arose, which was a movement to discern laws of aesthetic appreciation and arrive at a scientific approach to aesthetic experience. At the beginning of the twentieth century Neo-Kantian German philosopher and theorist of aesthetics Max Dessoir founded the Zeitschift für Ästhetik und allgemeine Kunstwissenschaft, which he edited for many years, and published the work Ästhetik und allgemeine Kunstwissenschaft in which he formulated five primary aesthetic forms: the beautiful, the sublime, the tragic, the ugly, and the comic. Iain Boyd Whyte writes that whilst "the Expressionist visionaries did not keep copies of Kant under their drawing boards. 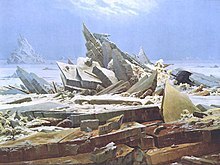 There was, however, in the first decades of this century [20th] a climate of ideas that was sympathetic to the aesthetic concerns and artistic production of romanticism. Artistic theories of Wassily Kandinsky, such as Concerning the Spiritual in Art, and Point and Line to Plane were centerpieces of expressionist thinking. A recurring concern of expressionist architects was the use of materials and how they might be poetically expressed. Often, the intention was to unify the materials in a building so as to make it monolithic. The collaboration of Bruno Taut and the utopian poet Paul Scheerbart attempted to address the problems of German society by a doctrine of glass architecture. Such utopianism can be seen in the context of a revolutionary Germany where the tussle between nationalism and socialism had yet to resolve itself. Taut and Scheerbart imagined a society that had freed itself by breaking from past forms and traditions, impelled by an architecture that flooded every building with multicolored light and represented a more promising future. They published texts on this subject and built the Glass Pavilion at the 1914 Werkbund exhibition. Inscribed around the base of the dome were aphoristic sayings about the material, penned by Scheerbart. "Coloured glass destroys hatred","Without a glass palace life is a burden","Glass brings us a new era, building in brick only does us harm" – Paul Scheerbart, inscriptions on the 1914 Werkbund Glass Pavilion. Another example of expressionist use of monolithic materials was by Erich Mendelsohn at the Einstein Tower. Not to be missed was a pun on the towers namesake, Einstein, and an attempt to make the building out of one stone, Ein stein. Though not cast in one pour of concrete (due to technical difficulties, brick and stucco were used partially) the effect of the building is an expression of the fluidity of concrete before it is cast. 'Architecture of Steel and Concrete' was the title of a 1919 exhibition of Mendelsohn's sketches at Paul Cassirer's gallery in Berlin. Brick was used in a similar fashion to express the inherent nature of the material. 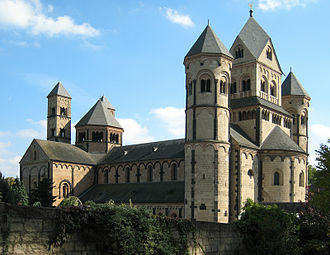 Josef Franke produced some characteristic expressionist churches in the Ruhrgebiet in the 1920s. Bruno Taut used brick as a way to show mass and repetition in his Berlin Housing Estate "Legien-Stadt". In the same way as their Arts and Crafts movement predecessors, to expressionist architects, populism, naturalism, and according to Pehnt "Moral and sometimes even irrational arguments were adduced in favor of building in brick". With its color and pointillist like visual increment, brick became to expressionism what stucco later became to the international style. An example of expressionist architecture in the film set for The Cabinet of Dr. Caligari. 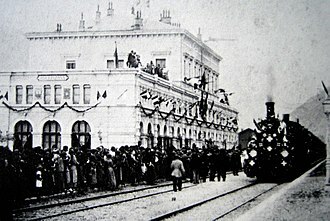 Europe witnessed a boom in theatrical production in the early twentieth century. In 1896 there were 302 permanent theatres in Europe, by 1926 there were 2,499. Cinema witnessed a comparable increase in its use and popularity and a resulting increase in the number of picture houses. It was also able to provide a temporary reality for innovative architectural ideas. Many architects designed theatres for performances on the stage and film sets for expressionist films. These were defining moments for the movement, and with its interest in theatres and films, the performing arts held a significant place in expressionist architecture. Like film, and theatre, expressionist architecture created an unusual and exotic environment to surround the visitor. Built examples of expressionist theatres include Henry van de Velde's construction of the model theatre for the 1914 Werkbund Exhibition, and Hans Poelzig's grand remodelling of the Grosses Schauspielhaus. The enormous capacity of the Grosses Schauspielhaus enabled low ticket prices, and the creation of a "people's theatre". Not only were expressionist architects building stages, Bruno Taut wrote a play intended for the theatre, Weltbaumeister. Expressionist architects were both involved in film and inspired by it. Hans Poelzig strove to make films based on legends or fairy tales. Poelzig designed scenographic sets for Paul Wegener's 1920 film Der Golem. Space in Der Golem was a three-dimensional village, a lifelike rendering of the Jewish ghetto of Prague. 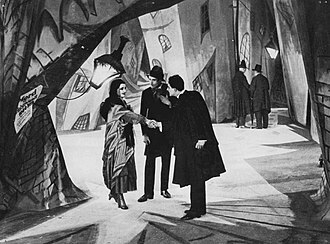 This contrasts with the setting of the Cabinet of Doctor Caligari, which was painted on canvas backdrops. Perhaps the latter was able to achieve more stylistic freedom, but Poelzig in Der Golem was able to create a whole village that "spoke with a Jewish accent." Herman Finsterlin approached Fritz Lang with an idea for a film. Fritz Lang's film Metropolis demonstrates a visually progressive 'Futurist' society dealing with relevant issues of 1920s Germany in relation to labour and society. Bruno Taut designed an unbuilt theatre for reclining cinema-goers. Bruno Taut also proposed a film as an anthology for the Glass Chain, entitled Die Galoschen des Glücks(The Galoshes of Fortune) with a name borrowed from Hans Christian Andersen. On the film, Taut noted, "an expressionism of the most subtle kind will bring surroundings, props and action into harmony with one another". It featured architectural fantasias suited to each member of the Chain. Ultimately unproduced, it reveals the aspiration that the new medium, film, invoked. DER BLAUE REITER almanac 1912, cover by Wassily Kandinsky. Two groups of Expressionist painters: "Der Blaue Reiter" in Munich since 1912 and "Die Brücke" in Dresden since 1905. The tendency towards abstraction in art corresponded with abstraction in architecture. Publication of Concerning the Spiritual in Art in 1912 by Wassily Kandinsky, his first advocacy of abstraction while still involved in Der Blaue Reiter phaze, marks a beginning of abstraction in expressionism and abstraction in expressionist architecture. The conception of the Einstein Tower by Erich Mendelson was not far behind Kandinsky, in advancing abstraction in architecture. By the publication of Kandinsky's Point and Line to Plane in 1926 a rigorous and more geometric form of abstraction emerged, and Kandinsky's work took on clearer and drafted lines. The trends in architecture are not dissimilar, as the Bauhaus was gaining attention and expressionist architecture was giving way to the geometric abstractions of modern architecture. The term Brick Expressionism (German: Backsteinexpressionismus) describes a specific variant of expressionism that uses bricks, tiles or clinker bricks as the main visible building material. Buildings in the style were erected mostly in the 1920s. The style's regional centres were the larger cities of Northern Germany and the Ruhr area, but the Amsterdam School belongs to the same category. Amsterdam's 1912 cooperative-commercial Scheepvaarthuis (Shipping House) is considered the starting point and prototype for Amsterdam School work: brick construction with complicated masonry, traditional massing, and the integration of an elaborate scheme of building elements (decorative masonry, art glass, wrought-iron work, and exterior figurative sculpture) that embodies and expresses the identity of the building. The School flourished until about 1925. The great international fame of German Expressionism is not related to the German Brick Expressionist architects, but to the German Expressionist painters of the two groups "Die Brücke" in Dresden since 1905 (Kirchner, Schmidt-Rottluff, Heckel, Nolde,...) and "Der Blaue Reiter" in Munich since 1912 (Kandinsky, Marc, Macke, Münter, Jawlensky,...). The legacy of expressionist architecture extended to later movements in the twentieth century. It had an influence on its immediate successor, modern architecture, as well as Art Deco. The new objectivity (Neue Sachlichkeit) art movement arose in direct opposition to expressionism. Expressionistic architecture today is an evident influence in deconstructivism, the work of Santiago Calatrava, and the organic movement of blobitecture. Another movement that grew out of expressionism to become a school in its own right is Metaphoric architecture which includes elements of biomorphism and Zoomorphic architecture. The style is very much influenced by the form and geometry of the natural world and is characterised by the use of analogy and metaphor as the primary inspiration and directive for design. Perhaps the most prominent voice of the Metaphoric architectural school at present is Dr. Basil Al Bayati whose designs have been inspired by trees and plants, snails, whales, insects, dervishes and even myth and literature. He is also the founder of the International School of Metaphoric Architecture in Málaga, Spain. Many of the founders and significant players in expressionist architecture were also important in modern architecture. Examples are Bruno Taut, Hans Scharoun, Walter Gropius, and Mies Van der Rohe. By 1927 Gropius, Taut, Scharoun and Mies were all building in the international style and participated in the Weissenhof Estate. Gropius and Mies are better known for their modernist work, but Gropius' Monument to the March Dead, and Mies' Friedrichstrasse office building projects are basic works of expressionist architecture. Le Corbusier started his career in modern architecture but took a turn for a more expressionist manner later in life. First identified at the Exposition Internationale des Arts Décoratifs et Industriels Modernes in 1925, art deco shares some characteristics of expressionism and is likely to have been influenced directly by the Expressionist movement – particularly the activities of the Weimar Bauhaus – and more generally with the factors and politics that influenced both movements at the time, such as socialism and mechanisation. In common with art nouveau and expressionism they are interested in decorative effects that break with the past and reflect a new modernity. The bold use of zigzag and stepped forms, and sweeping curves and chevron patterns. New materials are employed in new ways such as glass, aluminum, and stainless steel. Later examples of Art Deco, particularly in New York City can be seen as a Transatlantic equivalent of European expressionism. The influential architectural critic and historian, Sigfried Giedion in his book Space, Time and Architecture (1941) dismissed Expressionist architecture as a side show in the development of functionalism. In the middle of the twentieth century, in the 50s and 60s, many architects began designing in a manner reminiscent of expressionist architecture. In this post war period, a variant of expressionism brutalism had an honest approach to materials, that in its unadorned use of concrete, was similar to the use of brick by the Amsterdam School. The designs of Le Corbusier took a turn for the expressionist in his brutalist phase, but more so in his Notre Dame du Haut. In Mexico, in 1953, German émigré Mathias Goeritz, published the "Arquitectura Emocional" (Emotional architecture) manifesto where he declared that "architecture's principal function is emotion." Modern Mexican architect Luis Barragán adopted the term that influenced his work. The two of them collaborated in the project Torres de Satélite (1957–58) guided by Goeritz's principles of Arquitectura Emocional. Another mid-century modern architect to evoke expressionism was Eero Saarinen. 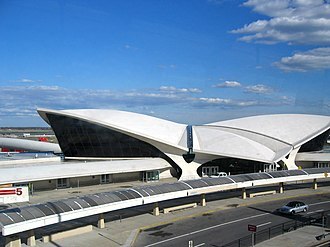 A similar aesthetic can be found in later buildings such as Eero Saarinen's 1962 TWA Terminal at JFK International Airport. His TWA Terminal at JFK International Airport has an organic form, as close to Herman Finsterlin's Formspiels as any other, save Jørn Utzon's Sydney Opera House. It was only in the 1970s that expressionism in architecture came to be re-evaluated in a more positive light. More recently[when?] still, the aesthetics and tactility of expressionist architecture have found echo in the works of Enric Miralles, most notability his Scottish Parliament building, deconstructivist architects such as Zaha Hadid and Daniel Libeskind, as well as Canadian Aboriginal architect Douglas Cardinal. Reactions to Art Nouveau impelled partly by moral yearnings for a sterner and more unadorned style and in part by rationalist ideas requiring practical justification for formal effects. Art Nouveau had however, opened up a language of abstraction and pointed to lessons to be learned from nature. (1909–1912) Adolf Loos gives a collection of speeches throughout Germany that eventually become his satirical essay/manifesto "Ornament and Crime," which rejects applied ornament in favour of abstraction. Hans Poelzig sets up practice in Breslau. Designs a water tower for Posen (now: Poznań, Poland), described by Kenneth Frampton as a certain Die Stadtkrone image, and an office building which led to the architectural format of Erich Mendelsohn's later Berliner "Mosse-Haus" in 1921. Hans Poelzig designs a chemical plant in Luboń with strongly expressively articulated brick massing. Peder Vilhelm Jensen-Klint wins design competition for Grundtvig's Church in Copenhagen, Denmark. WENDINGEN 1918–1931, Dutch architecture and art magazine. Main theme: Expressionist architecture (Amsterdam School, de Klerk, Kramer, Mendelsohn, Finsterlin, Feininger et al.). Movement against "De Stijl" (Cubist architecture) in 1917. Michel de Klerk starts building the Het Schip the third and most accomplished apartment buildings at Spaarndammerplantsoen, for the Eigen Haard development company in Amesterdam . Work is completed in 1921. November – Arbeitsrat für Kunst (Worker's Council for the Arts), founded by Bruno Taut and Adolf Behne. They model themselves consciously on the Soviets and attach a leftist programme to their Utopian and Expressionist activities. They demand; 1. A spiritual revolution to accompany the political one. 2. Architects to form ‘Corporations’ bound by ‘mutual aid’. November – Novembergruppe formed only to merge with Arbeitsrat für Kunst the following month. It proclaims; 1. 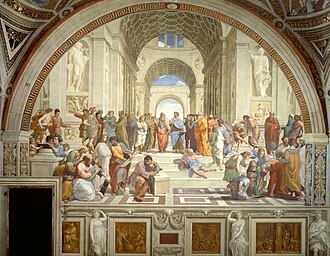 Creation of collective art works. 2. Mass housing. 3. The destruction of artistically valueless monuments (This was a common reaction of the Avant Garde against the elitist militarism that was perceived as the cause of World War I). December – Arbeitsrat für Kunst declares its basic aims in Bruno Tauts Architeckturprogramm. It calls for a new 'total work of art', to be created with active participation of the people. Spring manifesto of Arbeitsrat für Kunst is published. Art for the masses. Alliance of the arts under the wing of architecture. 50 artists, architects and patrons join led by Bruno Taut, Walter Gropius and Adolf Behne. April – Erich Mendelsohn, Hannes Meyer, Bernard Hoetger, Max Taut and Otto Bartning stage exhibition called 'An Exhibition of Unknown Architects'. Walter Gropius writes the introduction, now considered to be a first draft for the Bauhaus programme published later in the month. 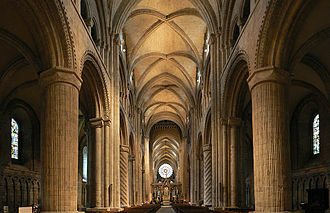 Called for a ‘Cathedral of the Future’, to unify the creative energy of society as in the Middle Ages. Taut maintains his Scheerbartian views. He publishes ‘Die Auflösung der Städt' (The dissolution of the city) in line with Kropotkinian anarchist socialist tendencies. In common with the Soviets, it recommends the breakup of cities and a return to the land. He models agrarian communities and temples in the Alps. There would be 3 separate residential communities. 1. The enlightened. 2. Artists. 3. Children. This authoritarianism is noted in Frampton as although socialist in intent, paradoxically containing the seeds of the later fascism. Amsterdam, Plan Zuid, PL-Takstraat, 1923. "Amsterdam, Mecca of Social Housing"
Walter Gropius designs the Monument to the March Dead in Weimar. It is completed in 1922 and inspires the workers' gong in the 1927 film Metropolis by Fritz Lang. Erich Mendelsohn visits works of the Dutch Wendingen group and tours the Netherlands. He meets the rationalists JJP Oud and W M Dudek. He recognises the conflict of visionary and objective approaches to design. Erich Mendelsohn's Mossehaus opens. Construction is complete on the Einstein Tower. It combines the sculptural forms of Van de Weldes Werkbund Exhibition theatre with the profile of Taut's Glashaus and the formal affinity to vernacular Dutch architecture of Eibink and Snellebrand and Hendrikus Wijdeveld. Einstein himself visits and declares it ‘organic’. Toompea Castle is rebuilt for the Riigikogu in Tallinn, Estonia, as the only expressionist style parliamentary building in the world. Hermann Finsterlin initiates a series of correspondence with Antoni Gaudí. Congrès International d'Architecture Moderne (CIAM) convenes in Switzerland. Hugo Häring fails to move consensus away from Le Corbusier's call for rationalism towards an organic approach. Finally the Scheerbartian vision is eclipsed as the non-normative ‘place’ orientated approach is cast aside. Design of Hallgrímskirkja in Reykjavík, Iceland by Guðjón Samúelsson. 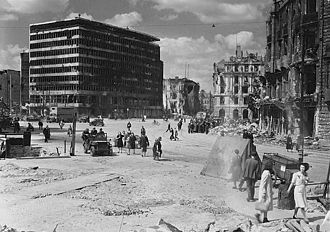 The Berlin Philharmonic concert hall is destroyed in 1944 during World War II. Church of The Highway by Giovanni Michelucci is inaugurated in Italy. ^ Taut, Die Stadtkrone 1919 p.87, quote "Architecture is art and ought to be the highest of the arts. It consists exclusively of powerful emotion and addresses itself exclusively to the emotions." ^ Pehnt, p.19, Taut's mention of "earth-crust architecture" and what Poelzig deemed, "Important to remodel the earth's surface sculpturally." ^ "Centennial Hall - visitWroclaw.eu". Retrieved 17 April 2017. ^ Bingham, Neil (2012). "1974–2000 The Dextrous Architectural Drawing". 100 Years of Architectural Drawing: 1900–2000. London: Laurence King. p. 288. ISBN 978-1780672724. ^ "Un arquitecto árabe invierte más de un millón de euros en un centro cultural (Arab Architect Invests More than a Million Euros in Cultural Centre)". ^ "The Canadian Encyclopedia". Retrieved 17 April 2017. ^ "The Canada Council for the Arts". Archived from the original on 3 December 2010. Retrieved 17 April 2017. ^ Hendel, archINFORM – Sascha. 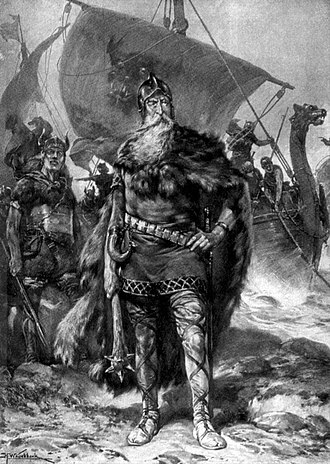 "Hermann Finsterlin". Retrieved 17 April 2017. Breitschmid, Markus (2017). "Alpine Architecture – Bruno Taut", in: Disegno – Quarterly Journal for Design, No. 14, London (Spring 2017),pp. 62–70. Stissi, Vladimir (2007). Amsterdam, het mekka van de volkshuisvesting, 1909-1942 (Amsterdam, the Mecca of Social Housing, 1909-1942), Dutch language, more than 500 ill., NAi Rotterdam. Benson, Timothy. O. (); et al. (2001-09-17). Expressionist Utopias: Paradise, Metropolis, Architectural Fantasy (Weimar and Now: German Cultural Criticism). University of California Press. ISBN 0-520-23003-5. Bullock, Alan; Stallybrass, Oliver; Trombley, Stephen, eds. (1988). The Fontana Dictionary of Modern Thought (Paperback). Fontana press. p. 918 pages. ISBN 0-00-686129-6. Bletter, Rosemarie Haag (Summer 1983). "Expressionism and the New Objectivity", in: Art Journal, 43:2 (Summer 1983), pp. 108–120. Bletter, Rosemarie Haag (March 1981). "The Interpretation of the Glass Dream: Expressionist Architecture and the History of the Crystal Metaphor, in: JSAH (Journal of the Society of Architectural Historians), vol. 40, no. 1 (March 1981): 20–43. Wikimedia Commons has media related to Expressionist architecture. Bruno Julius Florian Taut was a prolific German architect, urban planner and author active during the Weimar period. He is known for his works as well as his designs. Taut was born in Königsberg in 1880, after secondary school, he studied at the Baugewerkschule. In the following years, Taut worked in the offices of architects in Hamburg. In 1903 he was employed by Bruno Möhring in Berlin, where he acquainted himself with Jugendstil, from 1904 to 1908, Taut worked in Stuttgart for Theodor Fischer and studied urban planning. 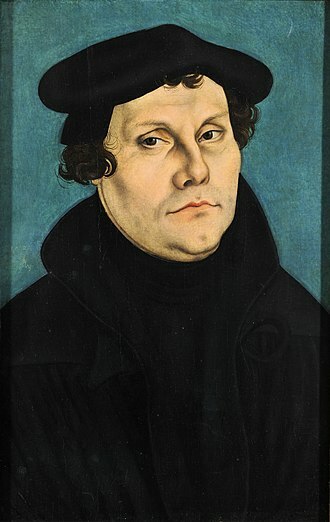 He received his first commission through Fischer in 1906, which involved renovation of the church in Unterriexingen. In 1908, he returned to Berlin to study art history and construction at the Royal Technical Higher School of Charlottenburg, a year later, he established the architecture firm Taut & Hoffmann with Franz Hoffmann. Tauts first large projects came in 1913 and he became a committed follower of the Garden City movement, evidenced by his design for the Falkenberg Estate. His aim was to make a whole building out of glass instead of using glass as a surface or decorative material. He created glass-treaded metal staircases, a waterfall with underlighting, and his sketches for the publication Alpine Architecture are the work of an unabashed utopian visionary, and he is classified as a Modernist and, in particular, as an Expressionist. Much of Tauts literary work in German remains untranslated into English, muthesius introduced him to some of the Deutscher Werkbund group of architects, including Walter Gropius. 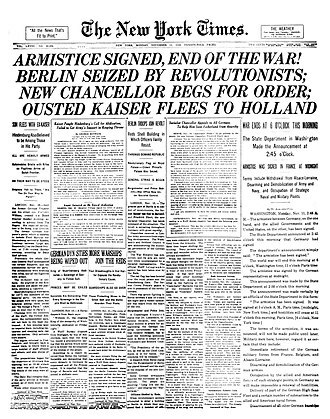 Taut had socialist sympathies, and before World War I this hindered his advancement, Tauts practical activity ended with the World War I. He became a pacifist and so avoided military service and he began to write and sketch, less to escape from the brutalities of war than to present a positive utopia in opposition to this reality. Taut designed a circular garden city with a radius of about 7 km for three million inhabitants. The City Crown was to be in the very center and inaccessible, it would have been the culmination of a community and cultural center, a skyscraper-like, purpose-free crystal building. Bernhard Hans Henry Scharoun was a German architect best known for designing the Berlin Philharmonic concert hall and the Schminke House in Löbau, Saxony. He was an important exponent of organic and expressionist architecture, Scharoun was born in Bremen, German Empire. After passing his Abitur in Bremerhaven in 1912, Scharoun studied architecture at the Technical University of Berlin until 1914 and he had already shown an interest in architecture during his school years. At the age of 16 he drafted his first designs, in 1914 he volunteered to serve in the First World War. 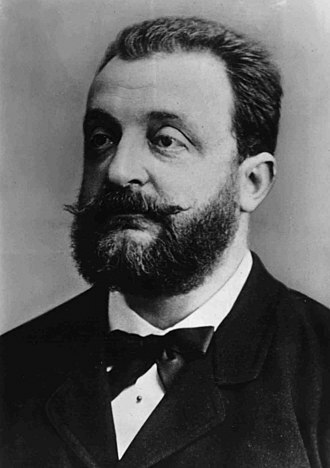 Paul Kruchen, his mentor from his time in Berlin, had asked him to assist in a program for East Prussia. In 1919, after the war, Scharoun assumed responsibility for its office as an architect in Breslau. There and in Insterburg, he realised numerous projects and organised art exhibitions, such as the first exhibition of the expressionist group of artists, Die Brücke and he received a professorship at the Staatliche Akademie für Kunst und Kunstgewerbe Breslau where he taught until its closure in 1932. In 1919 he had joined Bruno Tauts expressionist architects group the Glass Chain, in 1926 he entered the architects association Der Ring. In 1927 Scharoun built a house in the Stuttgart Weissenhof Estate and he had responsibility at the end of the twenties for the development plan of a large housing estate, Siemensstadt, in Berlin. 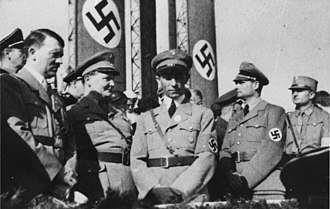 The organisation of social living space played a central role, during the Nazi era he remained in Germany, whilst many of his friends and colleagues from the Glass Chain or Der Ring went abroad. In this time he built a few family houses, one of which is the remarkable Schminke house in the city of Löbau in Saxony. Subsequent houses had to adapt outwardly to politically determined construction specifications, during the war he was busy with reconstruction after bomb damage. He recorded his ideas and visions secretly in numerous watercolors. With these imaginary architectures he prepared mentally for a time after the Nazis, after the end of the Second World War he was appointed by the Allies to the city building council and named director of the Abteilung Bau- und Wohnungswesen des Magistrats. 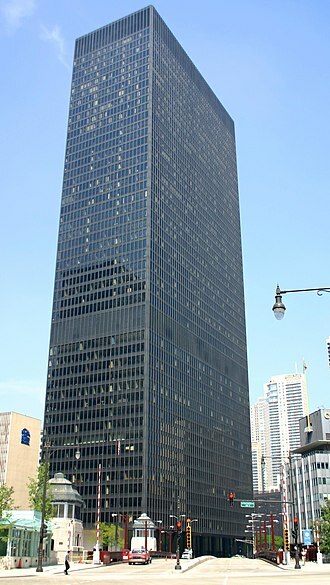 Ludwig Mies van der Rohe was a German-American architect. He is commonly referred to and was addressed as Mies, his surname, along with Le Corbusier, Walter Gropius and Frank Lloyd Wright, he is widely regarded as one of the pioneers of modernist architecture. Mies, like many of his post-World War I contemporaries, sought to establish a new style that could represent modern times just as Classical. He created an influential twentieth-century architectural style, stated with clarity and simplicity. His mature buildings made use of materials such as industrial steel. He strove toward an architecture with a framework of structural order balanced against the implied freedom of unobstructed free-flowing open space. He called his buildings skin and bones architecture and he sought an objective approach that would guide the creative process of architectural design, but he was always concerned with expressing the spirit of the modern era. He is often associated with his quotation of the aphorisms, less is more, Mies was born March 27,1886 in Aachen, Germany. He worked in his fathers stone carving shop and at several design firms before he moved to Berlin. Mies served as manager of the Embassy of the German Empire in Saint Petersburg under Behrens. His talent was recognized and he soon began independent commissions. He began his independent professional career designing upper-class homes, joining the movement seeking a return to the purity of early 19th-century Germanic domestic styles and he rejected the eclectic and cluttered classical styles so common at the turn of the 20th century as irrelevant to the modern times. In 1913, Mies married Adele Auguste Bruhn, the daughter of a wealthy industrialist, during his military service in 1917, Mies fathered a son out of wedlock. In 1925 Mies began a relationship with designer Lilly Reich that ended when he moved to the United States, from 1940 until his death, artist Lora Marx was his primary companion. Mies carried on a relationship with sculptor and art collector Mary Callery for whom he designed an artists studio in Huntington, Long Island. The Amsterdam School is a style of architecture that arose from 1910 through about 1930 in the Netherlands. The Amsterdam School movement is part of international Expressionist architecture, sometimes linked to German Brick Expressionism, the aim was to create a total architectural experience and exterior. Imbued with socialist ideals, the Amsterdam School style was applied to working-class housing estates, local institutions. For many Dutch towns Hendrik Berlage designed the new urban schemes, with regard to the architectural style, Michel de Klerk had a different vision than Berlage. In the magazine Bouwkundig Weekblad 45/1916 Michel de Klerk criticized Berlages recent buildings in the style of Dutch Traditionalism, in this context, the Stock Exchange by Berlage of 1905 can be seen as the starting point of Traditionalist architecture. From 1920 to 1930 different parallel movements developed in the Netherlands, Traditionalism Expressionism De Stijl Rationalism Constructivism The specific Brick-Cubism by Dudok, the Expressionist architecture of the Amsterdam School was the most successful style of the 1920s. For many foreign architects, Amsterdam was the Mecca for new town extensions, but the Traditionalist movement lasted longer, until the 1950s, thanks to the so-called Delft School, represented by Martinus Grampré Molière at the Delft University of Technology. In the 1960s the Rationalist movement was dominant, in a well-known speech, the Dutch Rationalist, Willem van Tijen declared the Amsterdam School a warning example for architects. After the death of Piet Kramer in 1961, no institution or museum was interested in his Expressionist work. For that reason, all his drawings and models were burnt, the Amsterdam School had its origins in the office of architect Eduard Cuypers in Amsterdam. Although Cuypers was not an architect himself, he gave his employees plenty of opportunity to develop. The three leaders of the Amsterdam School Michel de Klerk, Johan van der Mey and Piet Kramer all worked for Cuypers until about 1910. Van der Meys major commission, the 1912 cooperative-commercial Scheepvaarthuis, is considered the point of the movement. Expressionism was a modernist movement, initially in poetry and painting, originating in Germany at the beginning of the 20th century. Its typical trait is to present the world solely from a subjective perspective, Expressionist artists sought to express the meaning of emotional experience rather than physical reality. Expressionism was developed as an avant-garde style before the First World War and it remained popular during the Weimar Republic, particularly in Berlin. The style extended to a range of the arts, including expressionist architecture, literature, dance, film. The term is sometimes suggestive of angst, in a general sense, painters such as Matthias Grünewald and El Greco are sometimes termed expressionist, though in practice the term is applied mainly to 20th-century works. The Expressionist emphasis on individual perspective has been characterized as a reaction to positivism, though an alternate view is that the term was coined by the Czech art historian Antonin Matějček in 1910, as the opposite of impressionism, An Expressionist wishes, above all, to express himself. Immediate perception and builds on more complex psychic structures, in 1905, a group of four German artists, led by Ernst Ludwig Kirchner, formed Die Brücke in the city of Dresden. This was arguably the founding organization for the German Expressionist movement, a few years later, in 1911, a like-minded group of young artists formed Der Blaue Reiter in Munich. The name came from Wassily Kandinskys Der Blaue Reiter painting of 1903, among their members were Kandinsky, Franz Marc, Paul Klee, and Auguste Macke. However, the term Expressionism did not firmly establish itself until 1913, though mainly a German artistic movement initially and most predominant in painting and the theatre between 1910–30, most precursors of the movement were not German. Expressionism is notoriously difficult to define, in part because it overlapped with other major isms of the modernist period, with Futurism, Cubism, more explicitly, that the expressionists rejected the ideology of realism. The term refers to a style in which the artist seeks to depict not objective reality but rather the subjective emotions. Dornach is a quarter of the French city of Mulhouse, and Dòrnach is the Gaelic name for Dornoch in the Scottish Highlands. 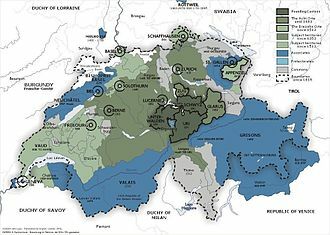 Dornach is a municipality in the district of Dorneck in the canton of Solothurn in Switzerland, Dornach is first mentioned in 1223 as de Tornacho. In 1307 it was mentioned as zu Dornach and it has been settled since at least 1223 when a local lay priest was known as Johannes de Tornacho. The site was the location of the decisive 1499 Battle of Dornach, the battle is memorialized in a 1949 relief wall. Today Dornach is famous for the Goetheanum and is home to the headquarters of the Anthroposophical movement founded by Rudolf Steiner. Dornach has an area, as of 2009, of 5.77 square kilometers, of this area,1 km2 or 17. 3% is used for agricultural purposes, while 2.67 km2 or 46. 3% is forested. Of the rest of the land,2.05 km2 or 35. 5% is settled,0.02 km2 or 0. 3% is either rivers or lakes and 0.01 km2 or 0. 2% is unproductive land. Of the built-up area, industrial buildings made up 3. 6% of the area while housing and buildings made up 22. 4%. While parks, green belts and sports made up 2. 3%. Out of the land,44. 2% of the total land area is heavily forested and 2. 1% is covered with orchards or small clusters of trees. Of the agricultural land,6. 1% is used for growing crops and 8. 0% is pastures, all the water in the municipality is flowing water. The municipality is in the Dorneck district and it consists of the village of Dornach which is made up of two villages and Dornachbrugg. Until the last quarter of the 19th century the two villages were completely separate, the blazon of the municipal coat of arms is Argent two Fish-hooks inverted and addorsed Sable. Dornach has a population of 6,538, as of 2008,23. 8% of the population are resident foreign nationals. Over the last 10 years the population has changed at a rate of 4. 2%, most of the population speaks German, with Italian being second most common and French being third. There are six people who speak Romansh, as of 2008, the gender distribution of the population was 47. 7% male and 52. 3% female. Anzeiger-Hochhaus in Hanover, 51m, built in 1928 by Fritz Höger. Bricks set to form a complex pattern, Böttcherstrasse, Bremen. South facade of the 1931 Poelzig Building at Goethe University, Frankfurt a. M.
Hans Scharoun (right), with Otto Nagel.